Choice is one of the best parts of the desktop Linux world, where there's a distribution to suit virtually every taste and purpose. The same goes for Linux desktops, in fact. GNOME, Unity, and KDE may get the lion's share of media attention, but there are myriad other choices available out there for those who don't like the default option in their chosen distribution. I've mentioned several alternative desktops before, and just recently one of them got a big update. Xfce--which is reportedly a favorite of Linux creator Linus Torvalds himself--has now reached version 4.10, and this latest release brings some compelling new features to the table. If you're not thrilled with your current desktop or are interested in finding a lightweight one with a small footprint, the new Xfce is definitely worth checking out. The culmination of more than a year of development, Xfce 4.10 is a stable version of the software that focuses primarily on polishing the desktop and improving the user experience, its developers explained in the software's official announcement late last month. Here's a rundown of some of its key new features. 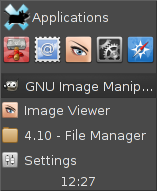 Xfce 4.10's application finder has been completely rewritten, the software's developers note, resulting in a new version that “combines the functionality of the old xfce4-appfinder and xfrun4.” The new app finder also now allows for the creation of custom actions matching a prefix or a regular expression pattern. Xfce's new deskbar mode, set to display five rows. Also new in Xfce 4.10 are a “deskbar” mode and several other tweaks to its panel, including a single panel-wide option for configuring the number of rows in the panel. In the new deskbar mode configuration, the panel is aligned vertically just as it is in vertical mode, but plug-ins are laid out horizontally. The result is that with multiple rows, you can create wide vertical panels suitable for wide-screen monitors. Users of Xfce can now launch applications and open files on the desktop with a single click of the mouse. In addition, the new software can display thumbnails and automatically advance through its wallpaper list. Xfce's window manager can now be configured to tile windows when dragging them to the screen edges, and its tab window supports more flexible theming and cursor key navigation, the project team says. Last but not least, with an eye toward making documentation more up to date, the Xfce developers have removed user manuals from the application packages. Instead, documentation is now hosted in an online wiki. An online tour offers a more complete introduction to the new features in Xfce 4.10. Want to test the desktop out for yourself? You can download it for free from the project site.